Led by Regional Organizer Mansoor Sabree, the IMAN Atlanta Project gained significant traction in all aspects of its mission this past month, from aligning with local legislators on pressing social justice issues to setting the stage for April’s first-ever CommUNITY Café in Atlanta. In early March, Sabree traveled to the Georgia State Capitol as a part of the Georgia Justice Project’s annual Lobby Day. Upholding IMAN’s commitment to criminal justice reform, he drummed up support for Georgia Senate Bill 367, which is designed to remove barriers to employment that employment that impede the reintegration of the formerly incarcerated into society. The IMAN Atlanta team stays in close contact with the Chicago headquarters in order to align with its efforts to pass the Removing Invisible Bars Bill (Illinois SB 2282), which is focused on substantial parole reform measures. 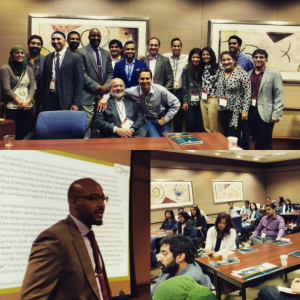 IMAN Atlanta supporter base was significantly deepened after Sabree and IMAN Executive Director Rami Nashashibi attended the Organization of Pakistani Entrepreneurs (OPEN) quarterly breakfast gathering. They shared IMAN Atlanta’s vision and achievements, thereby strengthening important networks and relationships. 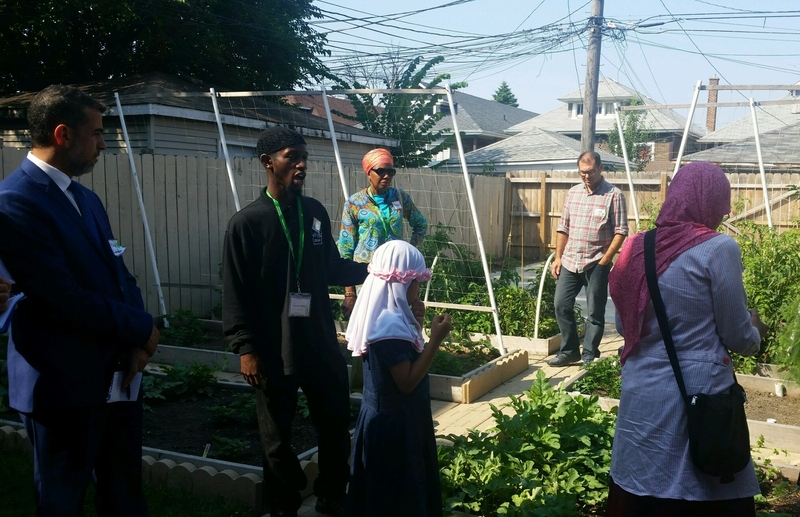 Sabree and Nashashibi also took advantage of their time together to visit like-minded organizations and potential partners like Greening Youth. Be sure to mark your calendars for Saturday, April 23rd, which will be the first CommUNITY Café held in Atlanta. CommUNITY Café: 1000 Mile Journey is headlined by Washington, D.C.-area rapper Oddisee, and will be the IMAN Atlanta Project’s entrée into the storied Georgia arts community. Follow IMAN Atlanta on Facebook for the latest news and updates! 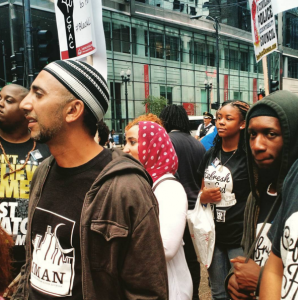 As the springtime weather warms up, IMAN’s Muslim Run Corner Store Campaign continues to serve as a vehicle for organizers and store owners to blossom. Over the past few weeks, Muslim Run has picked up new marketing techniques from an experienced partner organization, helped encourage fellow community members to make healthier beverage choices, and was featured in local media. 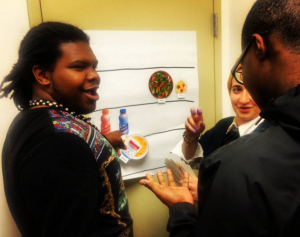 During one of their regular development meetings, Muslim Run leaders received expert advice from The Food Trust—a nationally recognized organization with a 20-year track record of food access work—on effective product marketing and layout techniques to pitch to local corner stores. The following morning, those leaders visited an exemplary Muslim Run partner store, Englewood’s Morgan Mini Mart, and established a new labeling system for the store’s healthy food options. Morgan Mini Mart also hosted the debut of a new nutrition workshop series, led by Muslim Run and UIC’s Chicago Partnership for Health Promotion. 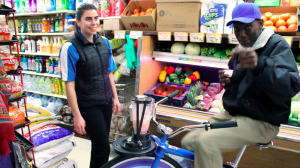 Residents blended their own free fruit smoothies on a special “smoothie bike”, and were engaged about their beverage habits and opinion on nutrition. Finally, organizers Shamar Hemphill and Sara Hamdan were interviewed by a journalist from the Chicago Reporter, and will be a central part of an upcoming feature article on cutting-edge food justice work on Chicago’s South Side. With candidates currently being interviewed for the chance to operate our upcoming Healthy Marketplace, IMAN’s health and wellness efforts are truly firing on all cylinders. Longtime leader Harun McGraw recently sat down with Communications Coordinator Dallas Wright to reflect on his tenure at IMAN, his long-term aspirations, and how his experience as an organizer has led to growth in various aspects of his life. Harun, how did you first get involved with IMAN? HM: I began working with IMAN in 2008. After the Friday prayer at a local mosque, I ran into Rami Nashashibi and Shamar Hemphill. After introductions, they shared with me IMAN’s mission, vision and the programs they offered at the time. They said they were headed downtown to a rally, and they invited me to tag along. So, I went with them…I had just met these guys [laughs], I was so open-minded. After the rally, we all went to grab lunch and then they told me even more about IMAN. I was really struck by how active and engaged Rami and Shamar were. So many times, I’d walked past neighborhood organizations and it looks like nothing is going on inside. But this felt different. The very first impression I got from IMAN was one of action. HM: Something that I’ll always remember is the Pillars of IMAN program. This was back in the summer of 2009, and we had a group of young guys that grew really close to each other. That was my first experience at IMAN doing serious relationship building. What was most impactful was being able to be my authentic self around the other guys in the program. Out in the neighborhood, you feel a big pressure to front and act tough. To be able to genuinely open up with brothers like Gemali Ibrahim and LaRon Hood was powerful for me, and those guys are my good friends to this day. I also really enjoyed working on the backyard garden at the Green ReEntry house at 6210 S. Fairfield. The high point of that experience was taking the green tomatoes that we [the youth interns] had harvested to the Fresh Beats & Eats Farmers’ Market to sell them. It was like we’d proven ourselves, because we produced something tangible without much oversight from our elders. That summer was also special because we got paid to do the work. Spiritual and networking benefits are definitely important, but so is putting money in our pocket. So many young people in the community don’t get many opportunities to do that in a dignified way, but we were fortunate to enjoy that success. What sort of skills have you sharpened during your years with IMAN? HM: A couple of things really stand out. Firstly, I know how to grow food now. That includes the physical planting of the seeds, but also the budgeting and other planning things that go into a productive garden. I was able to implement statistical knowledge I gained in school and apply it in a really interactive way. I’ve become a much better public speaker too. Shamar has sent me to places like the South Shore Chamber of Commerce, to conferences, and to other places to present IMAN’s work. Through experiences like those, I really found a voice. HM: First of all, come to IMAN [laughs]. Then, ask yourself why you want to get involved. Actions are according to intentions, so, if you don’t know what is motivating you to do the work, you will burn yourself out. Look for something bigger than yourself to get grounded in, and that will help you flourish. Dream about what your community could be in 30-40 years, because the way it is now doesn’t have to be the way that will end up. Then, it’s time to get to work. Congratulations on graduating from DePaul! What are your long-term plans? HM: Well my Bachelor’s Degree is in Sociology, so my goal is to earn a PhD and focus my research on more effective gang prevention efforts. I would want my research to be used at the grassroots level though, so I want to collaborate with local organizations to develop programs around that research.